and to call for the abolition of nuclear weapons. For action and event ideas see 2018 Nuclear Remembrance and Action Week Guide. Sydney. August 11. 11am. Time to ban the bomb. Rally at Town Hall Square followed by march at 12.30pm to Hyde Park. Contact Hiroshima Committee. Vienna. August 6. 6pm – 9pm. Hiroshima Day Commemoration Walk. Start at Stephansplatz and end with lantern ceremony at the pond in front of the Church of St. Karl. Contact Vienna Peace Movement / Hiroshima Group Vienna. Toronto. August 6. 6:30pm. Two Minutes to Midnight: Time to Ban the Bomb. Toronto City Hall Peace Garden. Prague. August 7. 6pm-9pm. Walk to commemorate HIroshima Day, Nagasaki Day and International Day for Youth. Guided walk to some of the peace sites on the Prague Peace Trail. Starts at Přemysl Pitter’s Milíč House and finishes at Letna Beer Garden. Contact PragueVision/PNND. Helsinki. August 6. 9pm. Hiroshima Day Commemoration. Speeches and music starts 9 pm and lanterns put to water 10 pm ; Speakers MP Maarit Feldt-Ranta, pastor Kari Kanala and peace organisation Committee of 100 secretary genreal Anni Lahtinen. Loviisa. August 6. 9:30pm. Walk with candels to sea and speache by MP Anders Adlercreutz. Mariehamn. August 6. 8pm. Candels and ceremony by the sea shore. Vantaa. August 6. 8.30 pm speaches ad musik and flowers to be put on the river..
Commemorations in more than 50 cities. For a list of the cities and events in Germany, please see Netzwerk Friedenskooperative (Network of the German Peace Movement) events calendar. Contact Netzwerk Friedenskooperative. Special #3DnukeMissile events. Interactive art installation depicting threat of nuclear weapons and actions to prevent nuclear war. International Fast for Hiroshima and Nuclear Disarmament. This fast, running from August 6-9, is being held in 20 locations aroud the world including Mutlangen and Büchel in Germany. For information about the fast in Germany contact Matthias Engelke. Information in French. Information in English. Hiroshima. August 5. 5pm-9pm. A summer evening of prayer and peace. A peace walk to soe Hiroshima shrines with performances. Higashi-ku, Hiroshima-shi, Hiroshima-ken. English flyer. Hiroshima. August 6. 8am-9am. Peace Memorial Ceremony. Peace Memorial Park. 1-2 Nakajima-cho, Naka-ku, Hiroshima-shi. Hiroshima. August 6. 6pm-10pm. Lantern floating ceremony. Motoyasu River. 1-1 Nakajima-cho, Naka-ku, Hiroshima-shi. Hiroshima. August 6. 6pm – 1am. Summer of Love. Local DJs and musicians commemorate Aug 6th at this free outdoor party. Hanover Koen Park, Motomachi, Naka-ku, Hiroshima-shi. Nagasaki. August 9. 11:00-12:00. Nagasaki Peace Memorial Ceremony. Nagasaki Peace Park. Auckland, August 5. 1pm – 4pm. Opening of Tumanako! (Maori for Hope), Children’s art works for a peaceful world exhibitions to commemorate Hiroshima Day. Auckland University of Technology. Exhibition continues at until 11 August, then at Takapuna Library 12 August – 25 August and SGINZ Ellerslie Centre 26 August. Contact Jimi Wallace, Soka Gakkai International New Zealand. Dunedin. Monday, 6 August – Hiroshima commemoration: Hiroshima Day will be commemorated with a ceremony featuring O-Taiko Drummers, readings and music – all welcome. Starts at 10.30am, at the Otago Museum Peace Pole. Organised by the National Centre for Peace and Conflict Studies. Hutt City. Sunday 19 August, 2pm. Opening of Tumanako! (Maori for Hope), Children’s art works for a peaceful world exhibitions to commemorate Hiroshima Day. Petone Central School Hall. Exhibition then continues until 8 September at Petone Library. Contact Jimi Wallace, Soka Gakkai International New Zealand. Timaru, Saturday 4 August, 10:30am. Opening of Tumanako! (Maori for Hope), Children’s art works for a peaceful world exhibitions to commemorate Hiroshima Day. Timaru Library. Contact Jimi Wallace, Soka Gakkai International New Zealand. Wellington. Sunday 5 August, 1:30pm. Opening of Tumanako! (Maori for Hope), Children’s art works for a peaceful world exhibitions to commemorate Hiroshima Day.The Wharewhaka. Exhibition then continues until 25 August at the Central Library. Contact Jimi Wallace, Soka Gakkai International New Zealand. Whakatane. August 5. Opening of Tumanako! (Maori for Hope), Children’s art works for a peaceful world exhibitions to commemorate Hiroshima Day. Contact Jimi Wallace, Soka Gakkai International New Zealand. Larvik, August 6. 12.00 – 12.30 Commemmoration of the Hiroshima day, by the Peace Tree next to the library. Speaker: Mayor Rune Hæiseth and representative from Larvik NTA Tore Vassdal. Music by young violinist Leo Hovland. Organizer: Larvik Nei til Atomvåpen (NTA) / No to Nuclear Weapons. Contact Sara Nes. Oslo. August 6. 2 pm – 3 pm. Commemoration of the Hiroshima day, at the Hiroshima monument at Youngstorget. Speakers: Mayor of Oslo Marianne Borgen and representatives of three youth parties. Music by singer Mika Mayumi. Organizer: Oslo Nei til Atomvåpen (NTA) / No to Nuclear Weapons. Contact Sara Nes. Heiden. August 9. Ceremony in memory of the Nagasaki bomb. Peace Bell by the Dunant Museum, 9410 Heiden. Bradford. Contact Yorkshire Campaign for Nuclear Disarmament. Coventry. August 6. 18:00-19:00. Hiroshima Day Commemoration. Conventry Cathedral. Contact David Fish. Derby. August 1 – 30. Unforegettable Fire. 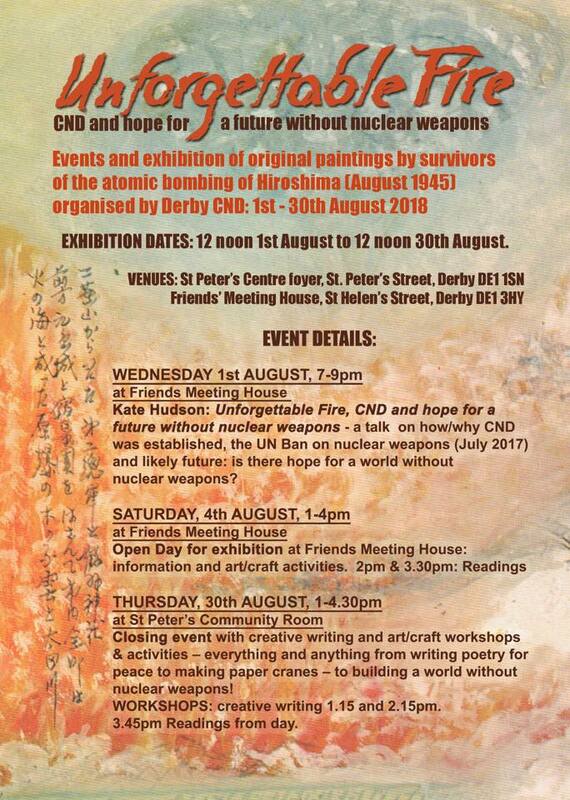 Exhibition of paintings and writings by survivors of the atomic bombings of Hiroshima. Opening event with Kate Hudson on 1 August at Friends Meeting House, St Helen’s Street, 7- 9pm. Then exhibition and events throughout August. Hastings. August 6. 9pm (approx). Lantern Floating Ceremony. Boating Lake, Alexandra Park. Organised by Hastings Agaist War. Kingston. August 6. Kingston Peace Council Hiroshima Day Commemoration. Assemble at Canbury Gardens on the Kingston river bank. Bring white flowers to cast onto the water in remembrance of those who died, and candles to illuminate the path beside the river. Leeds. August 9. 10:30 – 11:40. Leeds UK Hiroshima Nagasaki 73nd anniversary. Park Square, off the Headrow, near Leeds Town Hall. Contact Yorkshire CND. Liverpool. August 6. 11am – 12noon. Liverpool remembers Hiroshima and Nagasaki. St John’s Gardens, St John’s Ln. Liverpool. Contact Merseyside CND. London. August 6. 12pm onwards. Hiroshima Day ceremony. Tavistock Square. Opened by the Mayor of Camden. Organised by the London Campaign for Nuclear Disarmament. London. August 9. 18:30 onwards. Commemoration of the life and witness of Blessed Franz Jagerstatter at crypt chapel, Ambrosden Avenue, behind Westminster Cathedral, followed by peace walk to the Peace Pagoda for a Nagasaki Day commemoration. Organised by the London Campaign for Nuclear Disarmament. London. August 4 – August 9. A series of events in different London boroughs organised by local groups of the London Campaign for Nuclear Disarmament, including in Bromley (August 4 and 9), Kingston (August 6), Sydenham and Forest Hill (August 6 and 9) and Wimbledon (August 6). London. August 6. 6:30pm – 9pm. Film screening of The Man Who Saved the World. Friends House 173 Euston Road. Manchester. August 6. 10-11 am. Manchester Hiroshima Day event. Readings, poetry, a minute’s silence, creative workshops to fold Hiroshima paper cranes and Manchester bees. Living Worlds Gallery, Manchester Museum, Manchester University, Oxford Rd. Contact Sean Morris, Manchester City Council. Romford. August 6. 7pm-8:15pm. Remember Hiroshima Commemoration. St Edward the Confessor RC Church, Park End Rd, Romford. Sheffield. August 4. 12:30 – 13:30. Remembering Hiroshima & Nagasaki – Sheffield. Sheffield Peace Gardens, Pinstone Street, Sheffield. Contact Sheffiled Creative Action for Peace. Winchester. August 5. 12noon – 13:00. Silent vigil outside Winchester cathedral. Contact Winchester Quakers. Dunbar. August 6. 11;15am – 12:15pm. Hiroshima Memorial Service. St. Anne’s Episcopal and Methodist Church, Westgate, Dunbar. Contact Rev David Mumford. Albany, NY. August 6. 11am. Reading of John Hershey’s Hiroshima. Townsend Park, Albany. Contact Dan Wilcox. Arcata, CA. August 11. 9am – 9:30pm. Lantern Floating Ceremony to remember Hiroshima and Nagasaki. Klopp Lake. Asheville, NC. August 7. 4:30 – 5:30pm. Vigil in commemoration of the victims of Hiroshima and Nagasaki. Sponsored by PSR Western North Carolina. Atlanta, GA. August 9, 7pm. Seeds of Peace: 23rd Annual Nagasaki Observance. View event flyer. Avon, NY. August 15. 7:30pm. Annual Genesee Valley Citizens for Peace Hiroshima/Nagasaki Candlelight Vigil. Avon traffic circle, Routes 5 & 20, Avon. Contact Dr. Arnold Matlin or Suzanne Blackburn ph (585)245-1649. Ballston Spa, NY. August 8. Nuclear Holocaust Peace Pilgrims. Walk through West Milton, NY (Kenneth A. Kesselring Site) to Saratoga Springs, NY. Contact Neighbors Walking for Peace. Baltimore, MD. August 6. 2pm. City Council to adopt a ‘Back from the Brink nuclear disarmament resolution. City Council chambers, City Hall, 100 N. Holliday Street. Contact Max Obuszewski, phone 727-256-5789 or 410-323-1607. Boston, MA. August 9. 7pm, No More Nagasakis: A Commemoration, Community Church of Boston. Contact Cole Harrison, Massachusetts Peace Action. Brattleboro, VT. August 6. Nuclear Holocaust Peace Pilgrims. Walk to Vermont Yankee Nuclear Power Plant. Contact Neighbors Walking for Peace. Brooklyn, NY. August 4. 1:30 – 3pm. Abolish Nuclear Weapons Bay Ridge Brooklyn event. Assemble 4th Ave. between 96th and 97th Sts. March to 4th ave and Shore road for a vigil. Contact Peace Action Bay Ridge. Brunswick ME. August 4. 10am – 3pm. “Imagine a World Without Nuclear Weapons”. PeaceWorks 14th Annual Peace Fair. Brunswick Mall. Includes prelude film series and guest appearance by Sister Megan Rice. The Nuns, The Priests, and The Bombs. Contact PeaceWorks Brunswick. Chapel Hill, NC. August 9. 5:30pm – 8:00pm. Nagasaki Day Event in Chapel Hill – “The Coming War with China”. Chapel Hill Public Library. Columbia, SC. August 5. 2pm-5pm. Columbia Friends Meeting and Carolina Peace Resource Center’s Remembrance. South Carolina State Museum in Columbia. Doylestown PA. August 6. 5:30 pm. Hiroshima Day Peace Vigil. State & Main Streets. Easthampton, MA. August 5. 7pm – 8:30pm. The World We Want: Hiroshima and Nagasaki – Never Again! Nashawannuck Pond. Jamestown, RI. August 6. 12noon – 2pm Jamestown Hiroshima Day commemoration. East Ferry Green. Contact William Smith III phone 401-423-0433. King of Prussia, PA. August 6, 12pm. Hiroshima Day. PA – Lockheed Martin, Mall & Goddard Boulevards (behind the King of Prussia Mall). Lexington, MA. August 4. 1pm-3pm. Nuclear Holocaust Peace Pilgrims. Walk from Lexington Battle Green to Hanscom Air Force. Contact Neighbors Walking for Peace. Livermore, CA. August 4-5. Peace Camp held in conjuction with the August 6 rally and march at Livermore. Sponsored by Tri-Valley CAREs. Flyer for Peace Camp and Rally/March. Contact Scott Yundt. Livermore, CA. August 6. 8:00 – 11:00. Rally and March for Nuclear Abolition and Global Survival. Livermore National Laboratory, 7000 East Ave, Livermore. Contact Marylia Kelley. Lompoc, CA. August 6. Vanderberg Hiroshima and Nagasaki Day Witness. Lompoc, CA – Vandenberg Air Force Base (main gate) 747 Nebraska Ave. Contact co-sponsor – LA Catholic Worker. Los Angeles, CA. August 5. 73rd Annual Commemoration Service for A-Bomb Victims & Survivors. Koyasan Buddhist Temple. Los Angeles, CA. August 5. 3:30pm – 5pm. Hiroshima/Nagasaki public remembrance. At the Chain Reaction Peace Sculpture, Santa Monica Civic Center. Contacts Jerry Rubin and Denise Duffield. Los Angeles, CA. August 8. 6:15pm – 7pm. Support Fukushima, Remember Hiroshima and Nagasaki Memorial. Frances K. Hashimoto Plaza, Frances K. Hashimoto Plaze in front of JACC in Little Tokyo (South of Second Street between San Pedro and Central. Madison, WI. August 7. 6pm. Lanterns for peace 2018. The Tenney Park Shelter, 1414 E. Johnson Street, Madison. Manhasset, NY. August 6. 7:30pm. Imagine a World Without Nuclear Weapons. Unitarian Universalist Congregation at Shelter Rock: 48 Shelter Rock Rd, Manhasset. Manhattan, NY. August 3. 12noon – 1:30pm. New York commemoration of Hiroshima and Nagasaki Days In front of the Consulate General of Japan in New York, 299 Park Avenue, New York, NY (Between 49th and 48th Street). Contact Mari. Manhattan, NY. August 5. 12noon – 5pm. Hiroshima Nagasaki vigil and exhibit. Temperance Plaza in Tompkins Square Park: 120 Avenue A, New York. Contact: NYC War Resisters League. Niskayuna, NY. August 9. 7am. Nuclear Holocaust Peace Pilgrims. Nagasaki Day Action: Peace Vigil @ Knolls Atomic Power Laboratory (KAPL), Niskayuna, NY followed by walk to Troy, NY Contact Neighbors Walking for Peace. Philadelphia, PA. August 9, 6:30pm. Nagasaki Day. Saints Peter & Paul Catholic Cathedral. Contact – sponsor Brandywine Peace Community. Pittsburg, PA. August 5. 5pm. In this Corner of the World. Alphabet city. Poulsbo, WA. August 4-6. Nuclear Weapons No Deal: Hiroshima and Nagsaki Never Again. Actions on land and water at the Bangor nuclear submarine base and Groundzero Center for Nonviolent Action. Contact [email protected] Click here for the event flyer. Princeton, NJ. August 5. 6pm. Annual Hiroshima Day Commemoration. Hines Plaza. Contact Larry Kane. Montecito, CA. August 6. Sadako Peace Day 2018. Sadako Peace Garden, La Casa de Maria. Poetry, music and origami crane making in commemoration of Hiroshima Day. Contact Nuclear Age Peace Foundation. Santa Monica, CA. August 5. 3:30pm – 5pm. Hiroshima/Nagasaki public remembrance. At the Chain Reaction Peace Sculpture, Santa Monica Civic Center. Contacts Jerry Rubin and Denise Duffield. Staten Island, NY. August 5. 11am. Readings from John Hershey’s Hiroshima: Annual commemoration of the atomic Bombings of Hiroshima and Nagasaki. Unitarian Church of Staten Island: 312 Fillmore Street, Staten Island, NY. Syracuse, NY. August 6. 12:00pm – 1:00pm (gather at 11:30am) Hiroshima Day Solemn Procession with giant puppets. March from behind City Hall Commons, Syracuse. Contact Diane Swords. Tucson, AZ. August 4, 4pm – 6pm. Hope for our children’s peace. Commemoration of Hiroshima Day. Unitarian Universalist Church. 4831 E 22nd St.
Tulsa OK. August 6 and August 9. 7pm – 8:30pm. Photo exhibit: Hiroshima and Nagasaki. Church of the Restoration (Unitarian Universalist), 1314 N. Greenwood Ave. Organised by Tulsa Peace Fellowship. Victoria, BC. August 9, 7pm-9pm. Wake Up! It’s Two Minutes to Midnight! Beacon Hill Park Band Shelter. Walpole, MA. August 4, 10:00 am, Walpole Common – Remember Hiroshima & Nagasaki: The Time to Ban Nuclear Weapons is Now, a peace vigil sponsored by the Walpole Peace and Justice Group. Washington DC. August 8. 9:45pm. Nagasaki Candlelight Vigil. White House (Lafayette Park). Contact Hiroshima/Nagasaki Peace Committee Mel Hardy 202-321-6727 or Kio Kanda 702-922-8514. Washington DC. August 9. 6:30 p.m. Nagasaki interviews with survivors, plus update on US nuclear weapons today. Featuring Diana Roose, FCNL Friend in Washington, and Anthony Weir, FCNL lobbyist on disarmament. Quaker Welcome Center, 245 2nd Street NE, Washington DC 20002, USA. Click here to RSVP. Waterton, MA. August 5, 7:30 pm, Remembering Hiroshima and Nagasaki. Waterton Square. Contact Watertown Citizens for Peace, Justice & Environment. Winsted, CT. August 6. 7:30pm. Candlelight Vigil to Remember Hiroshima. East End Park. Woodford, VT. August 7. Nuclear Holocaust Peace Pilgrims. Walk through Bennington, VT to Hoosick, NY. Contact Neighbors Walking for Peace.